Spread a clean cloth in a deep vessel. Pour the curd into this cloth. Collect the edges of the cloth and tie it tightly. Hang this to the refrigerator shelf. Place a bowl beneath this bag so that water from the curd collects into this bowl. Powder cardamoms and keep it aside. Wash Charonji seeds thoroughly and place them aside. Fix flour kneading blade in the food processor. Add the hung curd to the processor bowl. Add the artificial sweetener or sugar and cardamom powder to the hung curd. Run the processor till the mixture is smooth. Add the washed Charonji seeds and just whip to mix. Transfer the prepared Shrikand to a serving bowl and serve chilled. For rich, smooth textured & tasty Shrikand use curd made with full cream milk. For smooth textured & tasty but not rich & heavy Shrikand use curd made with full cream milk & cream removed after setting the curd. This curd will have some portion of cream which makes it smooth textured. Do not use fresh curd. Use curd which has been kept in fridge for one day. The quantity of hung curd will be more when we use one day old curd compared to fresh curd. Tie the curd cloth in the refrigerator so that curd will not turn sour. When using artificial sweetener, hang the curd to remove water from it for 8 to 9 hours. But when using sugar, hang curd for one full day. When we add sugar it melts and water is released so hang the curd for more time. If using sugar for this recipe, for every one cup of hung curd, take half cup of sugar---this is the measure. Do not throw away the water collected from the curd. Use it to curdle milk. Add saffron strands to the warm milk and soak it for few seconds. Then rub the soaked saffron with finger. Add this saffron milk to the hung curd in processor bowl and mix. Good quality saffron not only gives color but also gives a nice flavor. Usually, a few strands of pure saffron added to a cup of warm milk, gives a nice color and good flavor to the milk. If you get good quality saffron, use it in this recipe to get KesarShrikand. Many use food color to give this dish a nice lemon yellow color. I personally do not like to use any synthetic food colors. I prefer to use natural colors to the extent possible. So even if Shrikand is white in color, enjoy it, because it is the taste which matters more. Even if you store in fridge, curd turns sour quickly. So prepare this dish in smaller quantities and enjoy before it turns sour. If you are regularly using cardamom powder, then here is a tip to powder cardamoms. Take cardamoms in a mixie jar and add sufficient sugar to it. Powder the ingredients and store in an airtight bottle. Shrikand is a Maharashtrian sweet dish. Their festivals are incomplete without this Shrikand. Serve this dish chilled and relish it with your family members. Red kidney beans tho curry try chesanu. Baga vachindi. It is really nice in chapathi's. 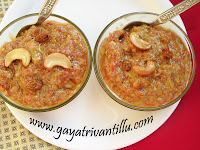 Today i watched Srikhand recipe. Curd ikkada yogurt ani dorukutundi tins lo. Can i use that? Oh sorry i forgot to mention my name in the previous blog i.e., about Srikhand. This is Lahari. Thank you. unna milk dorukutae. whole milk to paneer cheste baundi. Hey priya this is lahari. did u tried srikhand with yogurt? hi lahari garu, yes i was prepaired srikhand with yogurt.
" maggiga pulusu" kuda cheyavachu. gayatri garu,me " poruginti vatalu"
lo participate cheyalani undi.vedio s ite marokari support kavali.my hubby is busy with her work. photos ki voice add chese procedure cheppagalaru. I tried your recipe for Shrikhand and it turned up very tasty, pretty much like Amul's shrikhand. Your recipe is fool proof. Earlier I had tried others' recipes' but never managed to get close to the actual, and your idea of hanging the curd cloth in the refrigerator did the magic. Thanks so much, just as many other visitors have been saying your website is truly amazing and the pictures actually leave the visitor's mouth. watering ! !